Lots of photos were taken at Cowra this year. See this page in our gallery. Claire Goodwill & Colleen Hickey from BayBUG have a short article on their Tour de Cowra experience. You can read what they had to say on the BayBUG website. 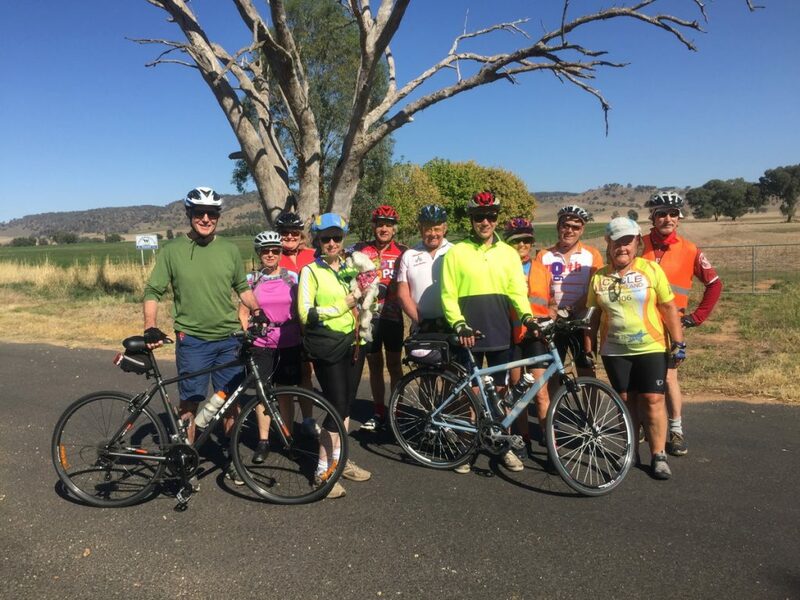 We have been regular riders with Bike North for more than 10 years and were encouraged to make our first visit to Cowra by the fact that some easy/medium options were scheduled. We brought with us a road bike and an e- Bike (one of three we saw in use on the rides) for carrying our doggie Darcy in a basket (see Darcy’s personal observations at the end) . Billimari (pop. 80) – out and back 44 kms, flat, average 20-25 kph, overcast/showery. The non-stop 22 km first leg was a challenge as we have been spoilt by the regular BN regroups on our weekend rides. We adapted by taking a thermos and cake to simulate the usual BN midway coffee break. It was a pleasure being on country roads after years cycling Sydney’s north shore. Perfect cycling conditions, a steady pace to admire the attractive green/brown farmland, regrouping points, toilet stop and our group of 13 stayed within sight all the way. A few concerns about tyre pressures with one tyre expiring just as we reached the coffee shop. • The Rose Garden Coffee House was a great place to start the rides and for different grades of Bike North riders to meet for the first time. After the rides, an opportunity to linger with BN friends and to satisfy the need for lunch and good coffee. Evening socialising was at the Bowling Club, Quarry Restaurant and other locations. • Interesting to see all the railway lines around Cowra unused but not removed (which requires special legislation). Many in the local community would like to see the tracks rehabilitated for freight but one person we spoke to mentioned the potential for cycling rail trails if the lines were ever removed. The abandoned railway storage facility in Cowra is definitely worth a visit as it has an extensive in situ collection of steam engines, carriages and equipment from the early part of last century. • We had boutique accommodation at Vineyard motel, an easy 3km south of the town: traditional wide country verandah around the perimeter of the 6 adjoining spacious rooms, high ceilings, French doors, extensive views over rolling hills to east/west. We will be back in 2017 and hope that more “Easy/Medium” riders join us (cleats and lycra optional!). 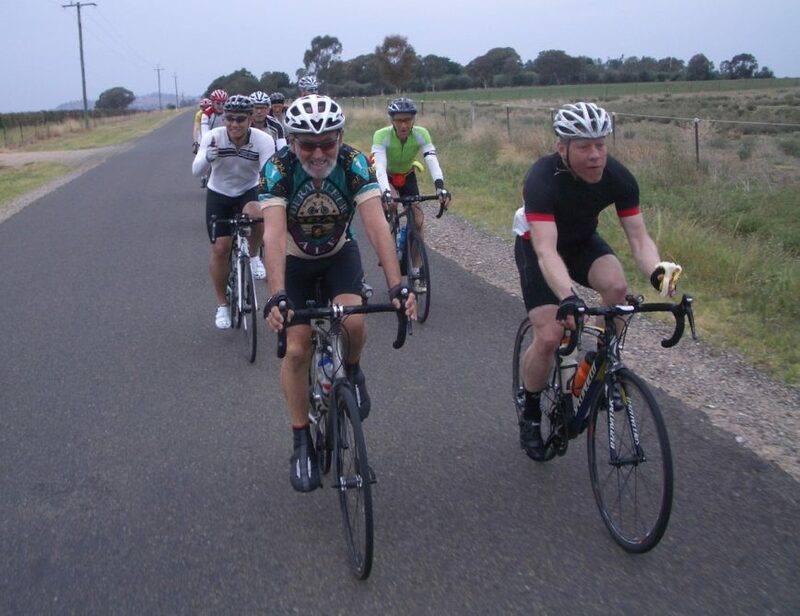 Hi, my name is Darcy and many BN members will have seen me over the last 4 years on weekend easy rides (that’s me in the centre of the group photo on the Wattamondara ride). I am a small white dog with a big personality and enjoy sitting in a basket on the back of my adopter’s bike with the breeze in my face and taking in the passing scents and sounds. I enjoyed running around the long wide verandah but did not like walking on the prickles in the rough grass, particularly when I found out they were called cat heads (double reason to avoid them). Instigated some good social sniffing with 2 fox-terrier puppies and a Jack Russell staying at the motel but carefully avoided being sniffed by the 3 large bull terriers that arrived on the last day. Cycling back from Billimari we met a Border Collie working on one of the farms. Wonder if I would be good at rounding up sheep?